It’s Week 13 of Handpicked Songs for Preschoolers. I feel like we’ve already been together for a while, but there is so much more to come! I can’t wait to share more of the great music available out there for you. If you don’t know much about me, I’m a music educator with over 10 years of experience working with children. So, along the way in this series, you’ll be getting some tidbits of the theory behind my work with preschoolers. If you have a preschooler, you’ll know all too well that your child is still developing both gross motor and fine motor skills. (You wouldn’t believe the number of dancing collisions I see daily!). But, I’d like to encourage you to make space for those collisions and encourage as much large motor movement to music as possible. Today’s song is an exercise in thinking outside of your rhythmic box. invites movement from all over your body, from your hips to your elbows. It makes use of the “extremities” as mentioned in the quote above, but also encourages movement from other body parts. I love the way the song encourages the listener to “feel the rhythm” here or there. I find it’s a simple and playful introduction to the concept of rhythm. 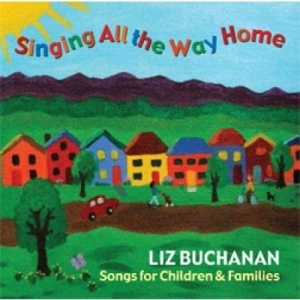 The version I like best is by Liz Buchanan, a children’s music and literacy expert. It’s relaxed and enjoyable to listen to. Some dances (like last week’s recommendation) tend to wind kids up. But Hey, Dr. Knickerbocker is a dance that encourages movement, but doesn’t leave your kids crazy. I love both types of dances, but sometimes you need one, not the other. This is off of her album “Singing All the Way Home”. You can find the song on Amazon or itunes. I can’t wait for you to give it a listen! Have thoughts, questions, or experiences in helping your child develop rhythm? p.s. Don’t leave without subscribing! It’s the best way to make sure you never miss a recommendation! Thanks for featuring my song, Stacia! I have enjoyed doing this song all year as a rhythm warm-up for my classes of 3 and 4 year olds. If anyone wants to download the song (or buy the album), I recommend buying directly through my site on CDBaby. http://www.cdbaby.com/cd/LizBuchanan It’s a better price than Amazon, and I love doing business with this company. And I also recommend my new album, “Once Upon a Tune,” for even more musical fun with young children. Also available on CDBaby. Have fun singing with the kids you love!